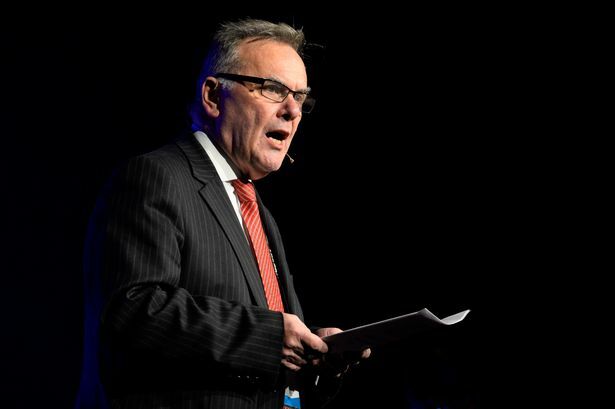 The region is "weeks away" from progress on a new authority which could put the Northern Powerhouse in the shade, claims Birmingham City Council leader Sir Albert Bore. Sir Albert said talks were progressing over a new combined authority which aims to draw billions of pounds of spending and powers from Whitehall to the region. Council leaders from Birmingham and the Black Country have agreed to form the new body, overseeing economic development and transport as well as other powers, but those in Solihull, Coventry and North Warwickshire are still to commit. Sir Albert, who again survived an annual leadership challenge this week, said progress would be made in "weeks, not months", and pledged to create an economic powerhouse without equal in the UK regions. He was speaking after a cabinet post was handed to a minister tasked with overseeing the Northern Powerhouse, the Government&apos;s prized project to boost growth in the North of England. London mayor and returning MP Boris Johnson will also sit in cabinet. Speaking to the Post, Sir Albert said the appointment of new Local Government Secretary Greg Clark - a former Cities Minister and exponent of decentralisation - was a positive move with plans for historic change. He said: "I think we can create an economic powerhouse in the West Midlands which is as powerful, if not more powerful, than any other in the country. "I am sure the political leaders at a local government level want to deliver that agenda. "We have been trying to make progress across the West Midlands area while being sensitive to political issues. I am hoping now we can quickly create something that we can be a bit more public about." He added: "We have always got on very well with Greg Clark and we will be trying to establish an even better relationship with the Department for Communities and Local Government and trying to push the combined authority agenda which could land us something that is an even bigger powerhouse. That has to be our agenda now." Senior Conservatives, including Chancellor George Osborne and former Deputy Prime Minister Lord Heseltine, have said they are committed to major devolution to the West Midlands. But a major sticking point has been getting Solihull to sign up and the leader of its council told the Post it was still to be won over. Already a deal has been agreed to devolve billions of pounds of spending power, including more than £1.3 billion borrowed against future business rate increases, in Greater Manchester. It is thought devolution to the West Midlands, which would include local authority areas in Birmingham, Wolverhampton, Walsall, Sandwell and Dudley as well as potentially the likes of Solihull and Coventry, among others, would bring about a larger potential spending pot. It would rely on striking a deal with government, over powers like infrastructure and skills, but would come with a demand for a region-wide mayor. That is likely to be a sticking point, as the Post understands none of the leaders signed up thus far has an appetite for creating such a role. However, Sir Albert thinks despite government rhetoric, this region has a strong offer. He said: "We are running an initiative called Midlands Connect, bringing together the West Midlands and East Midlands, and the technical work we have around that is far more sound than anything for One North. "If we can get connectivity across the Midlands then economic growth that comes as a result of HS2 can multiply." Elsewhere, Sir Albert said the promotion of Mr Clark was a welcome one. The Birmingham leader clashed with former Secretary of State for Communities and Local Government Eric Pickles - although he said it was never personal. However, Mr Clark has been a valuable ally to Birmingham in the past and, while Cities Minister, worked closely with Lord Heseltine on the Greater Birmingham Project, a key precursor to any future devolution. On Mr Pickles, he said: "On a personal note we got on OK but we had political differences. "He was a hard man as secretary of state. His agenda was tough on local government - not just Birmingham, local government generally. "I think we will be able to talk to Greg Clark a lot more easily. He has worked with the Core Cities and on the combined authorities so it is a similar agenda. "It was also welcoming news that Patrick McLoughlin will be staying on as Secretary of State for Transport. The funding we have got for transport has been a consequence of our good relationship with him. "He sat there with Michael Heseltine through the No Stone Unturned report and I hope he remains comfortable with that agenda." Creating a combined authority - five of which already exist in other UK regions - is central to accessing tens of billions of pounds of powers from Government. Solihull Council leader Bob Sleigh told the Post that, while he accepted the Government was keen to push forward devolution measures, the authority was still to be convinced joining a "Midland Powerhouse" would be the right move. He said: "Our position hasn&apos;t changed because some of the economic analysis still has to be done. "What is important for us in Solihull is knowing what we can achieve in a Midland Powerhouse, or whatever it is called, over and above our current growth plans. "I realise devolution is on the Government agenda - rebalancing the economy and giving more power to regions or local areas to make big decisions around areas like skills and growth strategies. "We have a strong economy and growth plans in Solihull and the issue for us is, if we get into a Midland Powerhouse, what can we achieve as an authority which we can&apos;t already?" City MP Jack Dromey said progress on combined authorities was key against a backdrop of falling spending on local government. Mr Dromey (Lab Erdington) said: "This will be both a very difficult period for Birmingham because the city is suffering the biggest cuts in local government history - but it is also a moment of opportunity, arising out of the new devolution settlement for England. "We must seize, with both hands, the opportunity now to build our strengths and transform Greater Birmingham once again into the workshop of 1,000 trades. "Crucially, all the councils must come together and put aside differences of the past in the best interests of building a strong economy, creating jobs and hope." However, on the issue of a region-wide mayor, he said the Prime Minister should listen to local authorities. He added: "There is all party support for a radical devolution of power and responsibility but David Cameron must allow Greater Birmingham to direct it. "Imposing a mayor against the will of local councils and local people is both unnecessary and would be wrong."